With technology becoming cheaper with each passing day, it's no wonder people want to get their hands on portable fish finders. Sometimes it can be hard or even impossible to mount a conventional fish finder on a small boat. Other than that, there might be no easy way to install a display or transducer. Manufacturers of fish finders have caught onto these problems, and are offering a whole range of products as a solution. That's why we have made portable fish finder reviews for five of the best devices on the market. 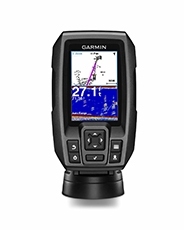 If you want a cheap and compact fish finder with CHIRP, you should consider the Garmin Striker 4. It may lack advanced navigation features, but it comes with a tempting price tag while offering GPS and dual frequency CHIRP sonar. This unit is one of the best choices for a kayak or small boat. Besides that, Garmin has been around on the market for a long time for a good reason. They put out quality products that last long and are easy to use, not just when it comes to fish finders. The Striker 4 has a lot of features packed into it. The Fish Symbol ID function interprets different return signals of the sonar and applies appropriate fish icons. It displays individual depth readings for each fish target. You can adjust the screen depending on depth with the smooth scaling feature. There's an option of auto-detecting fish, but also an easy way to mark up to 5,000 waypoints. Auto Gain filters out unwanted noise from this unit. Using UltraScroll, accurate scanning at higher speeds is possible as well. To summarize, this device can stand its ground when compared to more expensive and advanced products. The Deeper Smart Fish Finder is pretty much the best portable fish finder on the market when it comes to looks. This unit is the size and shape of a tennis ball. It connects to Android or iOS smartphones and tablets using Bluetooth and the Deeper Companion app. It works in depths from 1.5 feet up to 40 feet which cover most needs. Additionally, it operates in both salt water and fresh water. With a dual frequency, you can switch to one or the other for a better reading. Using this wireless echo sounder is as easy as attaching it to your fishing line. It's perfect for those hard to reach places, like bridges, docks, or when ice fishing. It has a rechargeable battery that lasts up to 6 hours, and a range of up to 130 feet. The Deeper Companion app is free. It features an integrated camera function, fishing calendar, accurate weather reports, diary, integrated social media networks and a map. 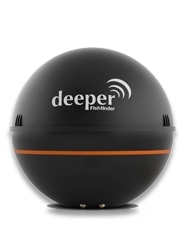 All in all, the Deeper Fish finder is ideal for enthusiasts and weekend fisherman. With a tablet, you can have a big screen fish finder for a fraction of the price of a professional device. Based on the Norcross F33P Fish Finder, this unit is an updated version. It works much the same way as its predecessor, but with a few changes. It has some great new features that make it more attractive. This portable finder is somewhat more expensive but makes up for it with improvements. It can measure water temperature, and its screen is easier to read. With a Dot Matrix display, you can see everything on it, even in bright, sunny conditions. On some cheaper devices glare can make a screen unreadable, but not on this HawkEye. It has dual-beam FishTrax Intelligent Sonar and auto-switching, as well as multi-level depth ranges. The auto-zoom tracking function is for better targeting of prey. You can place the sonar sensor can in the hull of your vessel or underwater. 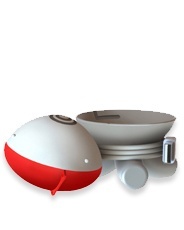 It provides a transducer that's portable or boat mountable. This is perhaps the best portable finder for fish with a cable connection. Even if Wi-Fi models can seem less restrictive, this unit is a joy to work with. If you're a fisherman that likes to cast off from a boat or Kayak, this is the option for you. 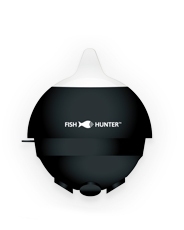 This unit is marketed as the world's fastest portable and wireless fish finder. It uses an app for Android and Apple tablets and smartphones to view readings. The FishHunter Pro floats on the water. It can be used to troll behind your boat after casting or for ice hole fishing to track water temperature. Initial setup of this unit can be somewhat tricky. Getting a reliable connection can be tough if you connect to the Fish Hunter before it's in the water. But, you won't have any problems if you cast it before trying to connect to it with your mobile device. Otherwise, it an intuitive unit. The official casting range is 150 feet. This is more than you'll need, especially if fishing from a smaller boat that's easy to maneuver. The FishHunter Pro works great on a calm lake. But, in rough conditions, the unit's usability goes down. Choppy waters make this device pick up false positives. In comparison, the depth finder is impressive. Even rough waters weren't able to prevent accurate readings of depth. It also gave a clear picture of the bottom of the lake we used to test this unit. If you're looking for a portable fish finder that won't break the bank, you should check out the iBobber. This is a very good idea put together into a cheap and affordable package. This unit is straightforward and intuitive. All you need to do is attach it to your fishing line and cast off with a lure. After that, you connect with your smartphone through Bluetooth. The iBobber supports both Android and iOS. 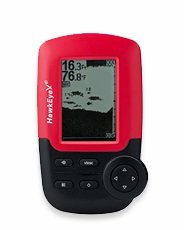 Once connected, this fish finder can give a depth reading of up to 135 feet. The accompanying app provides a basic sonar as well as some extras. You can make use of a lunar calendar and accurate meteorological data. It can also use GPS if you have it on your tablet or smartphone. The iBobber app pulls and saves GPS data which makes it quite a versatile device for its price tag. In conclusion, this unit is a budget option. This means that it doesn't possess the same accuracy as a standard fish finder. The mobile app that comes along with it can't process as much data as a regular fish finder. This bottleneck leads to some inevitable mistakes when identifying objects as fish. There are many advantages to a portable fish finder. They are the best choice for a fisherman who requires a mobile device and options when fishing. These units can pack away into a tackle box and cast off from many different locations. You can use them on riverbanks, while in a kayak, or when sitting on a dock, to mention just a few things. These units are usually cheaper and smaller than mounted devices but offer lots of value for the price. A lot of them are used with a phone or a tablet by way of Wi-Fi or Bluetooth. 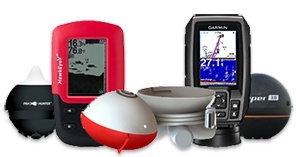 We hope that these reviews will be a valuable resource in choosing the best device for you and help you choose a fish finde﻿﻿r you need. Whether you're going to be casting off from the shore, into holes in the ice, or using a kayak, these units will prove useful. There are many models available with affordable price tags. They are all easy to use but have distinct drawbacks and advantages. That's why you should choose the one that best suits your needs. If you're more comfortable with buying and using a portable sonar fish finder after reading our articles, then we have been successful.